Is exactly what we should be telling a lot of high school students. Why push students down educational paths that will likely result in them dropping out? We should give everybody options that will help them succeed. It’s an article of faith in the school reform community that we should be striving to prepare all students for success in college—if not a four-year degree, then some other recognized and reputable post-secondary credential. The rationale is clear and generally compelling; as a recent Pew study reiterated, people who graduate from college earn significantly more than those who do not. Other research indicates that low-income students in particular benefit from college, becoming nearly three times more likely to make it into the middle class than their peers who earn some (or no) college credits. And it’s not just about money: College graduates are also healthier, more involved in their communities, and happier in their jobs. Here’s a stark fact: According to research by Georgetown’s Anthony Carnevale and Jeff Strohl, less than 10 percent of poor children now graduate with a four-year college degree. Imagine that all of our reform efforts prove successful, from initiatives to bolster the prenatal health of disadvantaged babies, to high-quality early-childhood experiences, to dramatic improvements in K-12 education, to serious interventions and supports at the college level. Push the pedal to the metal and assume that nothing crashes. Where do we get? Maybe in the course of a generation, we could double the proportion of poor children making it to a college diploma. Tripling it would be a staggering accomplishment. Anything approaching that would be an enormous achievement, unprecedented in the annals of social progress. Yet that would still leave two-thirds or more of low-income youngsters needing another path if they’re truly going to access the middle class. Let’s see how this works from the perspective of a student. Imagine that you’re finishing ninth grade at a large comprehensive urban high school. The year hasn’t gone very well; because you are reading and doing math at a sixth-grade level, much of your coursework is a struggle. Nor have you had much of an opportunity to develop the “non-cognitive skills” that would help you to remediate the situation. You are foundering, failing courses, and thinking about dropping out. Though we should be working hard to improve elementary and middle schools so that you don’t reach this point, the fact remains that you have. A rational system would acknowledge that, with just three years until graduation, the likelihood of you getting to a true “college readiness” level by the end of 12th grade is extremely low. Even if all the pieces come together in dramatic fashion—you get serious help with your basic skills, someone finds you a great mentor, your motivation for hitting the books increases significantly—you probably aren’t going to make it. You need another pathway, one with significantly greater chances of success and a real payoff at the end—a job that will allow you to be self-sufficient. 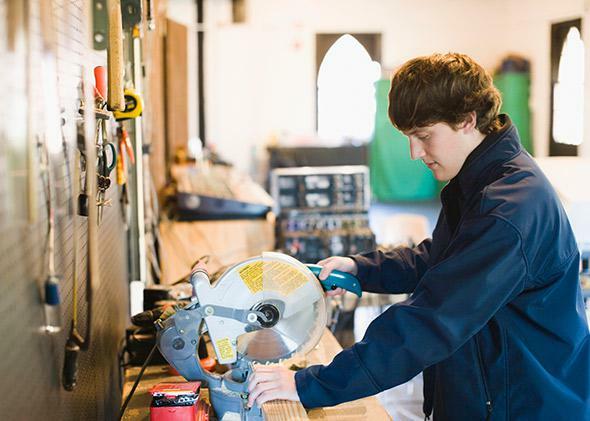 You need high-quality career and technical education, ideally the kind that combines rigorous coursework with a real-world apprenticeship, and maybe even a paycheck. To be sure, your long-term earnings will probably be lower than if you squeak out a college degree. But that’s a false choice, because you’re almost surely not going to get that college degree anyway. The decision is whether to follow the college route to almost certain failure, or to follow another route to significant success. But our system isn’t rational, and it doesn’t like to acknowledge long odds. Perhaps it used to, but this sort of realism was judged to be deterministic, racist, and classist. And for sure, when judgments were made on the basis of ZIP code or skin color, the old system was exactly that. Those high school “tracks” were immutable, and those who wound up in “voc-ed” (or, at least as bad, the “general” track) were those for whom secondary schooling, in society’s eyes, was mostly a custodial function. But making sure that there are real options for our young people—options that include high-quality career and technical education—is a totally different proposition. We shouldn’t force anyone into that route, but we also shouldn’t guilt kids with low odds of college success—regardless of their race or class—to keep trudging through academic coursework as teens. Yet it appears that we are doing just that; according to Kate Blosveren Kreamer of the National Association of State Directors of Career Technical Education, only 20 percent of high school students “concentrate” in career and technical education, even though that’s a better bet for many more of them. Then, even when students graduate high school with seventh-grade skills, we encourage them to enroll in college, starting with several semesters of “developmental” education. This might be the greatest crime. How do low-income students who start community college in remedial courses fare? According to the college-access advocacy group Complete College America, less than 10 percent of them complete a two-year degree within three years. Most won’t ever get past their remedial courses. Almost certain failure. College access advocates look at those numbers and want to double down on reform, seeking to improve the quality of remedial education, or to skip it entirely, encouraging unprepared students to enroll directly in credit-bearing courses, or to offer heavy doses of student support. All are worth trying for students at the margins. But few people are willing to admit that perhaps college just isn’t a good bet for people with seventh-grade reading and math skills at the end of high school. Unfortunately, our federal education policy encourages schools and students to ignore the long odds of college success. Federal Pell Grants, for instance, can be used for remedial education; institutions are more than happy to take the money, even if they are terrible at remediating students’ deficits, which is why I’ve proposed making remedial education ineligible for Pell financing. On the other hand, Pell can only be used for vocational education that takes place through an accredited college or university; job-based training, and most apprenticeships, do not qualify. That should change. I have no desire to punish students or deprive them of opportunity. Quite the contrary. My aim is to stop pretending that high school or college students with very low basic skills have a real shot of earning a college degree—so that they might follow an alternative path that will lead to success. A college graduate will generally outearn a high school graduate, to be sure. But a worker with technical skills will outearn a high school or college dropout with no such skills. That’s the true choice facing many students. Furthermore, for kids facing the toughest challenges of poverty, it makes sense to think about opportunity over multiple generations. College might catapult prepared low-income kids into the middle class in one fell swoop, but using high-quality career and technical education to give low-income youngsters who are not ready for college a foothold on the ladder to success is a victory as well. If they can escape poverty and all the social ills that come with it, their children have a significantly better shot at the college path. After all, that’s how upward mobility in America has generally worked: Not in one bounce but slowly and surely over decades. Happily, this sort of common sense is starting to re-enter the conversation (thanks, in part, to the persistence of the folks at Harvard’s Pathways to Prosperity initiative, who called in 2011 for a broader approach to education reform, one that includes high-quality career technical education). In a very important recent Politico piece, Stephanie Simon shows how lawmakers, especially in red states, are starting to worry that the “college for all” ideology is doing material harm to students. Asking all students to pass algebra II makes a ton of sense if you expect all of them to go to college. But when you are willing to acknowledge that that’s a fool’s errand, you start to see such mandates as barriers to opportunity—the opportunity to pursue career and technical programs that are likely to produce better long-term outcomes for young people. It’s particularly urgent that those of us who support the Common Core be willing to speak honestly about these issues. If the new Common Core assessments set the high school graduation bar at true college readiness—meaning students are on track to take credit bearing courses from day one—the country is likely to learn that scarcely one-third of all students, and many fewer low-income students, are at that level now. Even Massachusetts, our shining star, gets just half its young people to that level. By all means, we should do everything we can to boost those numbers, starting as early as possible, and including common-sense reforms like reintroducing serious academic content to the elementary and middle school curriculum and replicating “no excuses” charter schools like KIPP. At the same time, however, rather than pretend that we’re going to get “all students” to “climb the mountain to college,” we should build a system that helps many students find another road to the middle class—a path that starts with a better prekindergarten-through-eighth-grade education and then develops strong technical and interpersonal skills in high school and at community colleges. This is an honorable path, and one that’s much sturdier than the rickety bridges to failure that we’ve got now.